Howes and Faith, South Dakota experience tornadoes, but the storms were spectacular in nature. 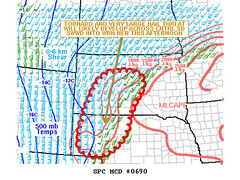 A spectacular tornado would churn the countryside between Howes and Faith South Dakota, but our level of optimism for a sucessful chase today would minimal at best. Shannon and I left Valentine, Nebraska to head to somewhere in South Dakota. 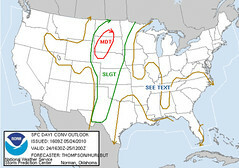 The Storm Prediction Center (SPC) issued a moderate risk of severe thunderstorms with a high probability of tornadoes across western and central South Dakota. However, we feared fast storm motions, bad road networks and poor terrain west of the Missouri River would hamper our efforts. By 12:00 p.m. storms were forming in far southwestern South Dakota and SPC had issued a tornado watch for the entire region. We took interstate 90 to highway 73 and found ourselves between two developing storms to our west and east. It was dicey because we weren't sure which storm would go tornadic and with such strong forcing the storms could have gone linear right away. Our best option was the developing storm to our west near Wasta, South Dakota. The road network seemed feasible so we made a decision to chase that storm. The warm front boundary was also to our west and we were hoping this would help the storm to become tornadic. The storm visually had a great structure. The shear was tilting the updraft to the right and no other storms were competing with it. As the road turned more to the northwest, we noticed a small lowering on its southwest flank. We pulled over on top of a hill as the road curved to the west to get a good view of the supercell. The terrain in this area wasn't as bad as we thought it would be, so we had an excellent view. The closest towns in the area were Howes, Plainview and Faith. Thankfully the area didn't have much population. After 10 minutes of watching the storm, a small funnel appeared underneath the wall cloud. The funnel eventually formed a distinct circulation on the ground which then became a tornado. We waited for about five minutes to see if it would dissipate but the tornado kept growing in size throwing up debris in the air. Storm chasers around us were ecstatic of the spectacle. We drove west to catch up with tornado near Howes, South Dakota. At this time, the tornado became large as it plowed through the field to our west. The supercell had many circulations within the updraft region and we had to be on the lookout for satellite vortices. Soon, a satellite rope tornado developed north of the main tornado and lasted for about two minutes. The main tornado crossed highway 34 in mostly rural areas and headed for Faith, South Dakota. Shortly, another satellite tornado formed to the north of the main tornado|mesocyclone but yet lasted under a minute. We continued to head north on highway 73 with the storm paralleled next to us with the tornado still on the ground. It eventually became a stovepipe tornado and then dissipated. The amount of storm chasers increased and everyone continued to follow the storm up to Faith, South Dakota. We all watched a new wall cloud form to our northwest. This would go on to produce additional tornadoes, but we decided to the let the storm pass to our north as it became engulfed with rain. Additional storms to our south became lined up into a squall line and produced a nice shelf cloud. At this point, we knew the chase was over and headed back to Pierre, South Dakota to stay the night. The tornado near Howes, South Dakota was rated an EF2 and was on the ground for over 30 minutes and traveled nearly 20 miles. It was one of the most amazing tornadoes I had ever seen. Special thanks to Shannon Lupton for coming along for chasing this awesome day.